I got a really great question in an e-mail this week, and thought I would share with everyone how I introduced close reading and annotation to my classes. I have the opportunity to loop with my students, so we start close reading in seventh grade, and by the time they get to eighth they are usually masters of it! By the ISAT this year, I had students annotating their reading passages with their highlighters, and I couldn't have been more proud. To start with, I pulled up the first page of the Hunger Games on google books and projected it on the screen. I have an entire blog post about this and the nonfiction article here. Everyone needed to agree on using the same key (this way it was easy to grade, and we were all consistent, so students could work together) I tell them they can use any colors they want, as long as it is marked in their key. ***Students can always add more, I wouldn't want to prevent them from doing that, but I only check what is on our agreed upon key. I have students put the annotation guide in their Interactive Student Notebook from Ms. W at Tales of Teaching in Heels. You can check out her blog post and freebie teaching annotation handout here! Next, we started with the first on the list, and went through the text looking for figurative language. It was kind of like a word search puzzle, which they enjoyed. You could even make it a game, the person to find the first example of figurative language can come up and squiggly line all the other examples of figurative language up on the board with the markers. Do this with your group, modeling it on the board for both the fiction and the non-fiction articles. Pass out a one page copy of another fiction or non-fiction article, and have students do it in groups/partners. Kelly Gallagher has tons of AoW (article of the week) on his web page, I usually use the Scope magazines. I do this over the next week or so, having students identify and share out (where I will project it and we mark it together), before having them go solo. Before they work in partners or solo, always create a key with them together on the board. Eventually, you may decide on a "fixed" key for fiction and non-fiction, but it's important to identify which key you are doing (fiction or non-fiction). I end up leaving these on the board once they are satisfied with which markings we are always going to use. 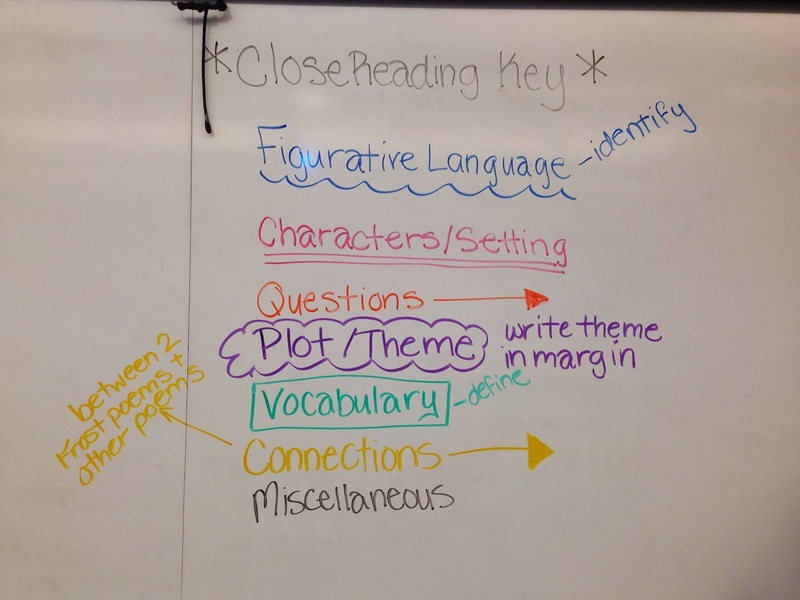 Students must label their close reading handout EVERY TIME with the key. This helps them, and you, along with their name at the top right hand corner. I will be assigning numbers this year so that I can have student helpers organize papers for me. I hope this helps with a practical application of starting close reading and annotation in your classroom! I feel like the simpler, the better with close reading "mechanics", since it is a very rigorous activity. The process of setup should not be intimidating for students. Make sure to offer TONS of encouragement as you model the process with them!